Since 2000, we at Endurance Films have covered nearly 100 events. And while our videos attempt to tell the tale from the competitive point of view, I thought I’d share a bit of the experience as videographers. I just returned from USAT Collegiate Nationals in Clemson where the scene is nothing short of electric. Fantastically fit collegiate athletes took the stage representing over 130 Colleges and Universities nationwide. The chants, costumes, team camaraderie, not to mention triathlon ability was on full display. Our job...capture all of it. And by all of it, that’s FIVE FULL RACES. Men and women draft legal Plus a High School National Champs (newly added this year) on Friday and then Olympic distance men and women on Saturday. Just a two-man crew, mostly on foot, charged with the task of filming all the action and turning it around within only hours of race finish and deliver a polished, all-encompasing highlight reel to present as the kick-off to Saturday night’s award ceremony. 1000 screaming collegiate athletes on their feet hoping for just a glimpse of themselves and teammates on the big screen. That is a mob we do NOT want to disappoint. But what really got us to this point? Let me back it up just a bit. We arrived in Clemson late after a bit of a delay. Our original plan was to get to the race venue to scout and plan our shots before night fall. Unfortunately, the travel gods would not cooperate and we’d be forced to wing it on race day. So, dinner, check into host hotel, and perform our camera checks, etc. in prep for the big day ahead. Oh yeah... thunderstorms in the forecast, great. A relatively late start for a race allowed us a bit of extra morning prep time. We got up around 7am, fueled up and headed to the race site in a light rain. We arrived alongside the athletes. 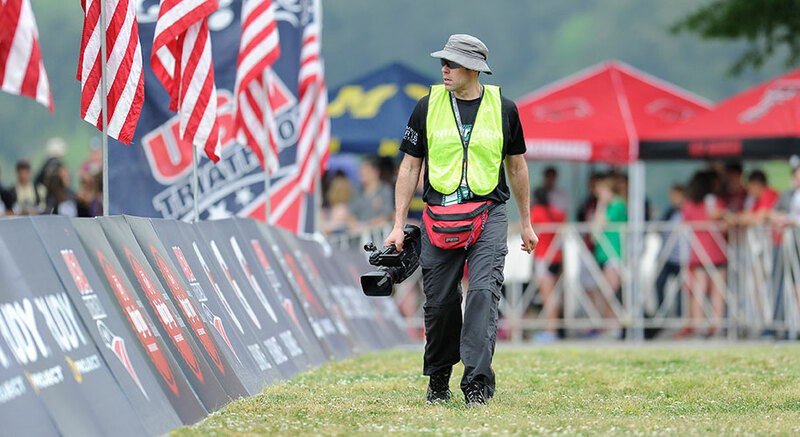 Our cameras and gear bags in hand, we made the trek up to our staging area at the USAT finishline HQ. After a few pleasantries with USAT brass, we hit the course for a quick scout before beginning our weekend of race coverage. The course was spectacular. A beautiful lakeside venue. A foggy mist rising off the water as athletes were already beginning pre-race warm-ups. In the distance, the glassy water was quietly being parted by the Clemson rowing team on their early morning practice. A quick check of the time alerted us that race start was less than an hour away. Time to divide and conquer. As a two-man team without the resources of a large production crew, we have to be very strategic about how we cover the course. Other than multiple angles at the start and finish line, we would rarely see each other over the next 6 hours of racing. The women’s draft race went off without a hitch and the weather even cooperated. Other than a few drops here and there, we stayed relatively dry. After swim start, my job was to head to transition area to catch the leaders as the exited the water and made their way through T1. Years of covering triathlon at all levels has prepared me for just about all circumstances. You have to know where to be and more importantly where not to be. My goal is to get as close to the action as possible without getting in the way. Being in the middle of a live transition can be a little hairy, especially when one eye is in the camera. Out on the bike is another story. Time to jump on the back of a motorcycle and catch the pack. Now, if I’m lucky, the moto will be a nice fat Honda Goldwing with armrests. Almost feels like a car. But sometimes, I’ve had to ride on the back of a crotch rocket and believe me, staring through the lens at 50 mph from a motorcycle can be scary. But, the shots are amazing. Pacing with the pack and capturing the intricacies of pacelining and drafting, and the effort on the athletes faces makes it all worth it. With so much great action to catch, it’s easy to lose track of time. Hopefully, my partner has positioned himself in T2 for the dismounts and bike-run transition. My job will be to get the runners as they head out on the course. No room for motorcycle on the run so we’ll have to hoof it from here, fighting through crowds to get a variety of run shots and represent all the different teams. Finally, the moment approaches. The finish. My partner and I sprint up to the finishline shoot to take our positions for the “money shot.” Standing shoulder to shoulder with the other photographers and cameramen, rehearsing the final shot and setting proper focus and camera settings. It’s a nerve racking moment. I think I have 2-3 minutes so I break out a Go Pro to set up another angle and then back to my position. Oh shoot! Battery is low...no time to change it now. Should be enough to finish the race. The moment of truth...down the finishline shoot, the crowd screams and cheers. I start with a tight shot and slowly pull out as the winner approache. There it is, the tape can be seen and full screen the winner crosses the line. “HOLD IT UP!” we yell… what good is a finishline shot if the winner doesn’t hold up the tape in glory. Got it. The perfect end. One race down, four more to go. Well, the rest of Friday ran about the same, other than some crazy rain delay, so I won’t bore you with those details. Saturday races would feature two Olympic distance events with nearly 1500 competitors. Our goal this day was to find some different shots. Try to get a little more creative now that we had so much footage from the day before. The main objective was to capture what we needed, get our money shots and quickly flee the scene. So, by 1p we were out of there and headed back to our hotel room/base camp. Now the real work begins. A combined 5 hours of footage had to be processed and edited into an exciting 2-minute highlight reel for the awards ceremony in just a few short hours. My deadline to complete, 7:15p. By the time all the footage was processed at 3p, that only gave me 4 hours to edit, polish and export the final piece. This is the most nerve-racking day of my entire year. To comb through hours of amazing footage and whip up a killer highlight video in crunch time worthy of kicking off the awards festivities is a daunting task. The adrenaline was flowing the entire time. First the opening shots...school chants and cheers...then pre-race prep to start line. The GUN! Swim start, a sea of swimmers to the rise out of the water. Peeling off wetsuits on the run up to transition and then the chaos of T1. The mounts to the aero fluidity on the bike. And then back to more chaos in the dismount and T2. The excitement builds as the runners are on the course. Who is going to break the tape and take the crown? Down the finishline shoot they come. The crowd goes wild. Finally, the tape is raised. Pheeeeew!!! Finished just in time. Export file and deliver to the awards venue. Now, we can sit back and enjoy the fruits of our labor. Seeing the final product on the big screen in front of a captive audience of athletes who just hours before were on this race course is such a rush. As the video played, the screams and cheers rang out each time another recognizable face and team could be spotted. And that final closing shot with the tape raised and another winner crowned played to a standing ovation.